Here at Accelerate Productions we specialise in Creative Choreography and Movement Direction. We live and breathe it and have been involved in many projects requiring Creative Choreography including commercial, corporate and special events. Under the direction of international creative director Kwame Knight, Accelerate have provided Creative Choreography for companies such as Adidas, Reebok, Barclaycard, HSBC, Vauxhall, Mazda, Lulu Guinness, Emporio Armani, Lee Cooper and many more. We work on a wide range of projects such television shows, music videos, commercials, editorial, experiential, fashion and brand launches. 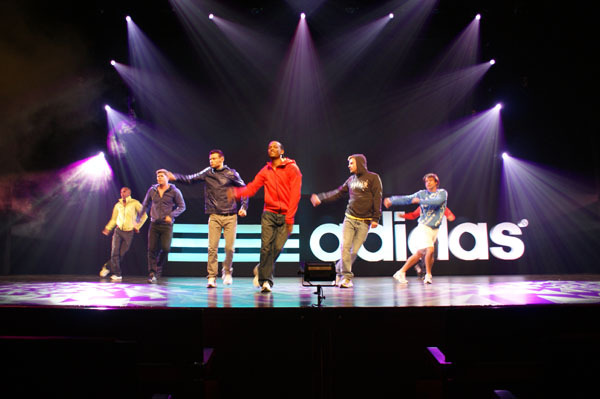 Creative Choreography is used in a variety of ways to bring brands and events to life and can be applied to almost any type of project. Creative Choreography can often be regarded as the synchronicity of devised dance movement – but this is not the case. It is also used by actors/actresses/models, in fashion shows, brand launches and special events. This is because all events and projects require precise timing and coordination. Accelerate, drawing on years of experience have been instrumental in devising choreography to suit all types of projects and briefs – a fundamental part of any event or project that requires choreography. Accelerate have the know how required to be able to implement a choreographic solution to suit almost anytype of project or event. Working on a wide variety of Creative Choreography platforms has given us a first hand insight in coordinating and directing. We are also available for choreographic consultation on any project. We are well are known for putting together Choreography for both small and large casts. Examples include a brief to provide over 150 dancers for a major flashmob at the South Bank in London. We were also commissioned to assemble a large cast for a Barclaycard viral commercial of 180 dancers and provided all the Creative Choreography for the international motor show at London’s Excel. Accelerate undertake all Creative Choreography projects with the same enthusiasm and professionalism which results in repeat business time and time again. Representing some of the finest choreographic talent in the UK, Accelerate are on hand for all your Choreography needs.